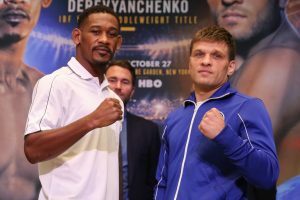 Daniel Jacobs believe his experience in World title action gives him the mental edge over Sergiy Derevyanchenko as they clash for the vacant IBF Middleweight crown at the Hulu Theater at Madison Square Garden in New York on Saturday night, live on HBO. Jacobs (34-2 29KOs) can become a two-time World ruler at Middleweight with victory over the Ukranian, but with the pair knowing each other inside out having trained alongside one another for years, Jacobs knows that this could be an intense battle with fine margins. The ‘Miracle Man’ enters his eighth World title contest against ‘The Technician’ who laces them up in his first bout for an elite belt after reaching 12-0 (10 KOs). The Brooklyn favorite has 44 rounds of action in World title fights, compared to the total of 57 rounds as a pro that amateur standout Derevyanchenko has had. Jacobs believes that experience in his return to Madison Square Garden – where he was edged out by Gennady Golovkin in a unification fight in – will see him regain World champion status. “I feel like I’m the strongest Middleweight that he has stepped in the ring with professionally,” said Jacobs. “The height and the reach are some key things, especially when I set my mind to be being a boxer, I can do that very well. “But if I want to come forward or be a counter puncher or even just want to outright brawl, I do believe that I have the power to back it up. So, there’s a lot of dangers inside this fight when it comes to both of us. But for me, I truly feel like I have the best advantages. “Once you put on ten ounce gloves and you actually go in there and compete with the best, all of these dangers that you have inside the ring, that’s when you’ll truly know. So, I feel like that I have the advantages when it comes to the mental aspect of the experience of knowing I can go full 12 solid rounds with the best of them and compete at an all-time high level. I mean, I know that. I have it in my bank, I have it in the gas tank already. Jacobs’ clash with Derevyanchenko is part of a stunning triple-header of World title action live on HBO, with unbeaten WBA Super-Featherweight champion Alberto Machado defends his title against Cleveland’s Yuandale Evans and there’s a mouthwatering rematch of the 2016 fight of the year contender between Heather Hardy and Shelly Vincent, with the WBO World Featherweight title.